I must tell you how inspired I am by Ragu's amazing new program called Mom's the Word on Dinner! A couple of weeks ago, I told you about The One-Bite Rule and how Mike and I used it (and still use it) to get our daughter and ourselves to try new foods. Watching the video's of other Moms describing their meal plans, offering tips and suggestions, offering support, sharing recipes... it's an incredible source of invaluable information and knowledge. After all, who knows what a Mom needs more than another Mom? There are many issues facing Mom (or Dad) when it's time to plan dinner: What to cook, how to make it appealing, how much to cook, and what to do with left-overs. You and I know that pasta on it's own is fairly bland. It must be paired with other ingredients to really shine. Spicy foods are always popular as long as the heat is manageable. Too hot and it's too much. Especially for the younger kids. How do YOU spice up dinner? Tonight, I'd like to tell you how we not only spice up our pasta dishes but how we get two great meals out of one quick and easy prep session! Place Ragu and salsa in a pot and stir together. Allow to simmer on low while preparing the shrimp. Rinse the peeled, deveined shrimp to ensure all the shell is off. In a skillet, saute the butter and onion and simmer on medium-low for 5 minutes until onions begin to soften, add the shrimp and garlic and toss occassionally until all of the shrimp is bright pink. Make sure each shrimp is nicely coated with sauce. Add the shrimp mixture to the Ragu / salsa pot and stir together. Continue to simmer on low as you prepare the linguine. Resist the urge to simmer on a higher temp as you don't want to over cook the shrimp! Sprinkle the top of the plate with pico de gallo and parmesan cheese and enjoy! A gourmet pasta dish in under than 30 minutes! This is my take on the New Orleans version of the Po-Boy. Simple, quick, and oh-so-delicious! Re-heat the Ragu / Shrimp mixture on low. (About 15 minutes). Slice open Hoagie rolls and place a slice of mozzarella on one side and provolone on the other. Toast until the cheese is bubbly. Pour some of the shrimp mixture over the Hoagie roll and serve with a side of veggies or a salad. It's a spicy, delicious meal that you and your kids will love! Your prep time for this dish? About 15 minutes! Two meals -- easy prep. More time spent with the kids! The fabulous folks at Ragu want to know what you think about dinner, too! You can connect with them at Mom's the Word on Dinner, @ragusauce on Twitter, and on their YouTube Channel. They have also very generously offered *FIVE* of my readers a chance to win a Jar of Ragu Sauce PLUS a $10 GC to help you prepare a fabulous meal for your family! I received no compensation for this post. The opinions expressed herein are my own and based on my own use of and experience with the item(s). I would like to try the Ragu Chicken Margherita recipe. We are a southern family so substituting sausage for meat is a good one for us. We also add Tony Chacherie's to everything, even ramen noodles. Lol. The CHICKEN ALFREDO WITH FETTUCCINE sounds really good to me. I add fresh veggies from the Farmer's Market...whatever's in season. I'd like to try the No Frying Chicken Parmesan recipe. RAGÚ® NO FRYING CHICKEN PARMESAN sounds healthy! I use cumin and Sazon Goya to spice up my recipes. I'd like to try the MAMA'S BEST EVER SPAGHETTI & MEATBALLS recipe from the Ragu site. I like to add some garlic and fresh herbs to my pasta sauce. I spice up pasta dishes with Romano cheese, garlic and a sprinkle of crushed red pepper. I'd like to try the RAGÚ® NO FRYING CHICKEN PARMESAN recipe. We spice up our sauce with onion and garlic. I would like to try the skillet pasta and beef. I like to add fresh garlic and mushrooms. I'd like to try the RAGU NO BOILING LASAGNA. I like to add a few extra dashes of all spice to my sauce to kick it up a notch. The Ragu Chicken Margharita recipe sounds really good. I'm big on hot sauce, onions, hot peppers as well as various spices. We spice up our recipes with red pepper flakes! Yum! I'd like to try the easy beef lasagna! i use lots of pepper to spice up my pasta! the skillet pasta and beef dinner looks yummy! I spice meals up with a little white wine and fresh herbs. I'd like to try MAMA'S BEST EVER SPAGHETTI & MEATBALLS from the Ragu site. Their RAGÚ® NO FRYING CHICKEN PARMESAN recipe caught my eye to try! I'd add my home-grown fresh herbs and add a can of stewed whole tomatoes to it. I'd love to try the SKILLET PASTA & BEEF DINNER. I like to add some red pepper flakes to my sauce and homemade meatballs are always great. I'd like to try the SLOW COOKER PIZZA MEATLOAF recipe. I add lots of garlic. CREAMY CHICKEN PRIMAVERA looks good. I would like to try the sloppy joe recipe. I'd add mushroom, peppers and a bit of Parsley. I like to use red pepper to spice up my pasta. I used only freshly grated cheeses! i spice up my pasta with lots of garlic yummy!!! I spice it up with some red pepper! I d like to try the easy fettucine primerva. I spice up my dishes with a ton of salt and fresh garlic! I want to try ragu sloppy joes, looks like an excellent quick meal! I do have sausage half hamburger to spice ours up! 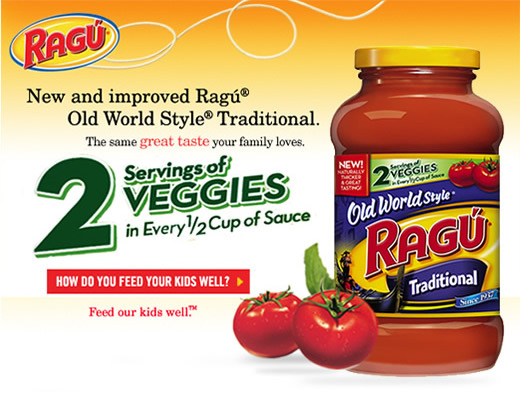 I would like to try the RAGÚ® NO BOILING LASAGNA! i add veggies and basil! yum! we add fresh ground pepper to everything! I would like to try the Chicken Alfredo with Fettuccine recipe. I spice up my pasta with some Slap Your Mamma spice and a little hot sauce too. I would like to the SKILLET PASTA & BEEF DINNER Recipe. I spice up my pasta dishes by adding my own personal touches to jarred sauce, like meats, peppers, or mushrooms. I most want to try the Ragu Sloppy Joes...my daughter love them! I spice it up by adding lots of herbs like basil and garlic and veggies (green pepper, mushrooms, onions). I would love to try the RICOTTA CHEESE PIZZA WITH ZUCCHINI recipe. I like to add a little hot pepper flakes to my pasta sauce. I'd like to try Ragu's EASY VEGGIE QUESADILLAS recipe - they look so yummy! I spice them up with adding sausage to the meat dishes, and various herbs to many that use sauces of different kinds. I would like to try the Ragu Sloppy Joes. I add basil to the sauce. I'd like Easy Bake Lasagna. I spice it up by adding crushed red pepper flakes and adding lots of extra garlic. I would love to try the Easy Skillet Ravioli. It looks so good and so easy to make. I spice up my dishes by adding herbs and spices to just about everything I cook. I especially like to add Lemon Pepper and Paprika. I add fresh vegetables and italian dressing to my pasta dishes. I would love to try the Classic Stuffed Shells. I like to add in chunky vegetables! and spices! I love to add some hot red peppers to pasta sauce to give it some bite! Also, depending on what we are making, we'll add some fresh sliced mushrooms, or chopped garlic & onion! Their recipe of the day "FETTUCCINE WITH CHUNKY FETA -TOMATO SAUCE" sounds great! I like to use fresh spices to make my food spicier. I like the FETTUCCINE WITH CHUNKY FETA -TOMATO SAUCE recipe. I usually add sauted onions and galic and cheese to spice up my pasta. The COD VERACRUZ recipe looks yummy! I would like to try the RAGU NO BOILING LASAGNA recipe. I'd like to try the Ragu Sloppy Joes. Sounds yummy! I love to put Tapatio in dishes for spice. I spice up my pasta with my kids favorite... mega meatballs, they love trying to fit these things in their mouth! I love having CHICKEN ALFREDO WITH FETTUCCINE!